In yesterday’s post, I mentioned a few “bad” movies that had really cool posters. For the second installment of this feature – you may have guessed – I decided to make the polar opposite observation. Now I am taking a look at posters that are an assault on the eyes, but the film itself was quite enjoyable. 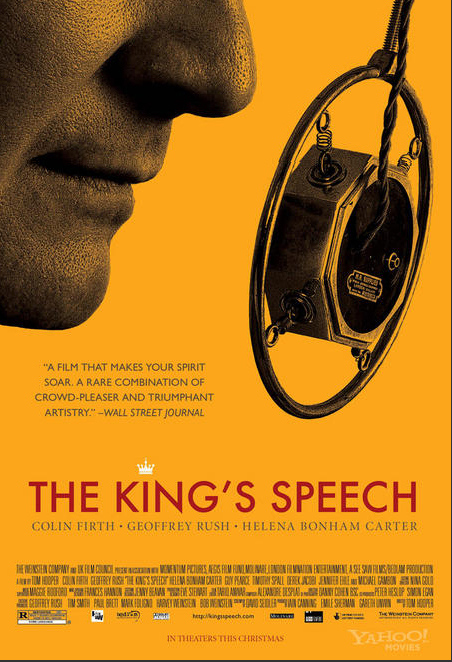 I am especially intrigued by the poster for The King’s Speech. Helena Bonham-Carter and Geoffrey Rush seem to be in a period comedy of manners (think Noel Coward), while Colin Firth is in an entirely different movie. As for Star Trek IV, it is simply an 80’s nightmare. As for X-Men First Class it looks like someone was on a deadline and had to produce something really, really quick. These designers could probably take a lesson from Simon C. Page. But I digress …. What awful posters can you think of which do not accurately represent the quality / your enjoyment of the motion picture they are charged with promoting? I so dislike a bad movie poster. Somehow I can’t understand how that happens. I mean, I KNOW, but I can’t understand. I admit I don’t pay as much attention to newer movie posters as I do to vintage. Your examples are perfect. I loved THE KING’S SPEECh and couldn’t find a single good poster to add to my blog list. So I grabbed the least bad one. The King’s Speech poster is insane. I keep thinking what do HBC and GR have to be so smug about; are they LAUGHING at His Royal Majesty? This one is a little better: http://thefilmstage.com/wp-content/uploads/2010/12/the-kings-speech-poster-2.jpg although his pores are quite visible. And the maize-ish color does no one any favors. P.S. I also loved Star Trek THE VOYAGE HOME, but what a tacky poster!! Yegads. And really, it’s quite a wonderful movie. It just seems like a rush job – like something I would mock up on the way to getting to a final design. Also did not feel like it was evocative enough to draw you in. The more I look at the ST one the more fault I find with it. It is quite hilariously awful. You should check out Perfume. It’s a odd little French movie that’s really all sorts of crazy.